The Walking Dead Episode 9.7 'Stradivarius' Review – AiPT! Episode 2 of the post-Rick & Maggie era continues, this time with a name that sings right to my music teacher heart. Let’s dive in, shall we? The episode opens with Rosita running from walkers, who are whispering to each other about trying to find her. Yeah, that’s about it for that plot point from last week. Moving on…. Last week, Carol stopped by to see Daryl. Turns out their meeting was not an accident. Carol wants Daryl to basically play nanny to Henry as he goes off to apprentice as a blacksmith at the Hilltop. As you might imagine, neither Daryl nor Henry are into the idea. Daryl hasn’t been doing so hot either. After searching for Rick’s body in the woods (and never finding it), he decided to just stay out there by himself. To his credit, though, he did find a dog…which he named Dog…but still, Daryl owning a German Shepherd feels so right that the name can stay. Later that night, after enjoying a bowl of snake and foot (?) stew, Carol and Daryl share a touching moment while she cuts his hair. I know some folks say that the bond between these two is a maternal one, but that is not the sense I get at all. But I digress…even later that night, Dog gets trapped and surrounded by walkers and caught in one of Daryl’s traps. I was about to riot at this point if Dog was killed, but Daryl came to the rescue with Henry…and told him to stay back…which predictably led him to Daryl in danger…which predictably lead to Daryl being saved by Henry…which predictably led to them bonding a bit. What I did not see coming was Carol hiding in the woods, bow and arrow at the ready. I think this implies that Carol set the whole scenario up with Dog being trapped. If so, then Carol just became a lot less cool in my book. Kill all the Saviors and infected group members you want, but don’t kill any doggos, please. Meanwhile, DJ, Siddiq, and Michonne accompany the new folks to the Hilltop. Chest Tattoo woman continually argues about wanting their weapons back, which comes to a head when the new people find their former camp trashed. Michonne says she was tagging along just to see if their story checked out (?) and would be heading back to Alexandria soon. Apparently, her and Maggie had a massive falling out before Lauren Cohen got a new show that would make them seeing each other both awkward and potentially deadly. While they camped for the night, Michonne hears a noise and goes to investigate. She finds Discount Oliver Platt hunched over something, assumes it’s a weapon, and slices his beautiful Stradivarius violin in half. This gives Discount Platt the chance to give a speech about how music is why humans evolved that was equal parts inspiring and eye-roll inducing (and I say both those things as a music teacher). Overall though, it was pretty good stuff. The next day, the group is surrounded by walkers (who apparently learned how to move silently in large groups). They give the New People their weapons back, almost all of whom turn out to have near perfect and lethal aim with a slingshot. Things come to a head when Chest Tattoo sees their zombified former group member, who Michonne mercifully puts down. Later on, Siddiq fills Michonne in on the fact that Maggie is no longer running the Hilltop. Instead, she went off with that weird lady in the white suit from last season. Michonne is ticked to learn that this information was withheld from her, but it still doesn’t change her mind about going to the Hilltop…until they are approached by two emissaries from there, who inform them that Rosita has been recovered, but is badly injured. This convinces Michonne to go. In place of Maggie, Jesus is running the Hilltop pretty darn well. Tara, his second in command, is also doing a great job–and far less annoying than she’s ever been. Unfortunately, Jesus isn’t a big fan of being leader. He’d much rather run off and have a two-man fight club with Aaron, which he explains to Tara as him keeping the lines of communication open with Alexandria. Guess Aaron never felt the need to tell Michonne about Maggie leaving either. Anyway, all that gets put aside when Aaron and Jesus see a flair from Rosita and run to her rescue. 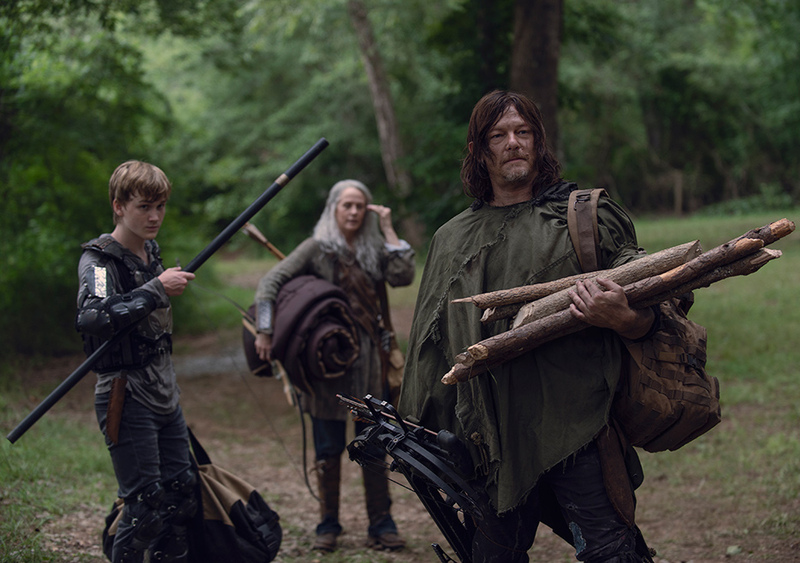 Later on back at the Hilltop (after Jesus and Aaron have returned), Daryl, Carol, and Henry arrive. Henry is excited to start blacksmithing and even more excited to start spitting game at Enid. Daryl decides to join the group going to look for Eugene and Tara agrees to look after the Hilltop while Jesus goes with them so he can do that awesome spin kick move we keep seeing in the episode previews. The good news is that this episode was pretty decent. It was great seeing Daryl and Carol together again (despite Carol’s insistence on putting a dog in danger to help Daryl bond with her adopted son). Jesus and Tara make a good team, both in a practical sense and in how they clash in leadership style and priorities. And Michonne’s past conflict with Maggie makes for an interesting background conflict. But was it an hour’s worth of episode content? Not really. If The Walking Dead wants to keep from falling back into the rut it found itself in before Rick and Maggie’s last episode, they’ve got to find a way to avoid a string of weeks where little to nothing happens. Also, they’ve got to make sure that things are consistent. For example: How could Michonne not know Maggie was gone if Aaron and Jesus were really hanging out all the time while they ninja trained? Maybe I’m missing something here, but that seems like a pretty big thing for both Siddiq and Aaron to hide from the leader of their community. Also, the new group really hasn’t grown on me yet. Like, at all. I guess I’m a little partial to the music teacher (for obvious reasons), but otherwise I can never remember their names, hence the terrible monikers I come up with for them in this column. Let’s hope that next week’s mid-season finale (ugh) gets the plot moving forward with some more momentum. A pretty good episode, but it feels like the show is falling into the same narrative quicksand that led to it's downward spiral the first time. It's great to see Daryl and Carol together again. Maggie's departure has been turned into a fascinating plot point involving Michonne. Jesus and Tara make a surprisingly good/compelling team. The show's narrative is starting to plod again. How does Michonne not know about Maggie being gone when two of her main people do?